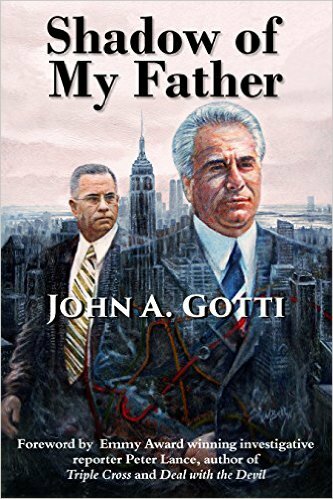 John Alite lied on the witness stand, in his book, his interviews, on Facebook and even during his speech at The Mob Museum about his relationship with deceased Gambino soldier and former acting captain for John A. Gotti, Bobby Boriello. Not only did Alite lie that he helped plot the 1990 murder of Gambino soldier Louis DiBono with Gotti and Boriello, but, Alite even lied in his book that he accompanied Boriello as back-up for John Gotti Sr. on a trip to former Gambino boss Paul Castellano’s mansion in late 1985 (which he coincidentally left out of his FBI debriefings and trial testimony because this lie would have been easily exposed as Castellano’s mansion was under constant FBI surveillance and Alite never showed up on the logs there). 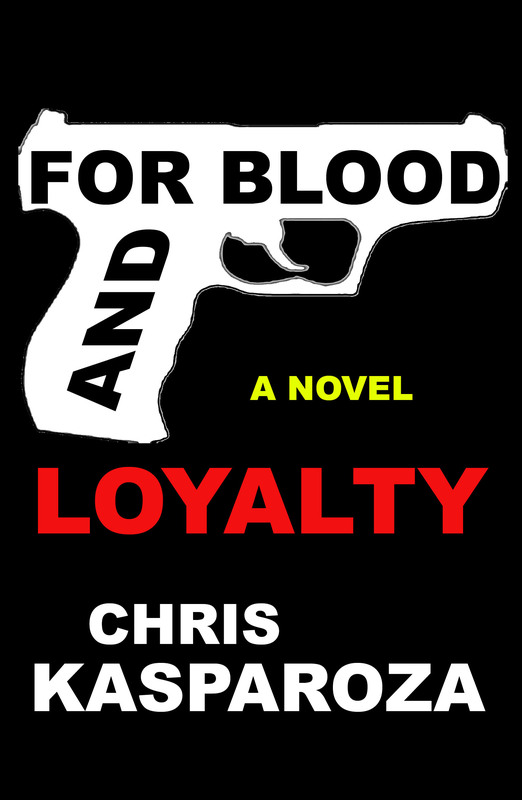 Read about that here: John Alite Never Went to Paul Castellano’s House. John Alite has repeatedly said that he was so close to Boriello that he spoke to and hung out with him daily. But: the problem is that while Boriello constantly showed up on FBI surveillance– not because he was John Gotti Jr.’s best friend and the best man at his wedding, but, more so because he was also a personal driver and bodyguard for John Gotti Sr. and constantly in his presence– Boriello appeared with Gotti Sr. on FBI surveillance all over the place, and, Alite never showed up once in those same FBI photos and videos with Boriello and Gotti Sr. If he had they would have been presented at the trials where Alite testified to make him a more credible witness. While John Alite did meet Boriello– there was a picture of Boriello present at a going away party for Alite before he went to jail in 1991 that was entered into evidence at the 2009 Gotti trial– they were never as close as he claims and what Alite left out of his book and every interview he’s given is that Alite’s story of his involvement with Boriello in the DiBono murder was contradicted at trial not just by government informant Kevin McMahon who plead guilty to being on the hit and made no mention of Alite having anything to do with it, but, also by Alite’s personal hero, former Gambino underboss turned cooperator Sammy Gravano who also made no mention of Alite’s (or Gotti Jr.’s) involvement in all the previous trials and grand juries that he testified at. Chances are that if Alite really was involved in mob murders, specifically one with former Gambino boss John Gotti’s bodyguard and his son he would have been killed by the Gambinos instead of just being chased by them in 1991 when they no longer wanted anything to do with him, especially when a corrupt police officer provided information that Alite was an informant in 1991. While Alite also was a minor witness who testified– lied– about the DiBono murder at the 2009 Charles Carneglia trial, where Carneglia was convicted of this murder, Carneglia was not convicted based on Alite’s lies. 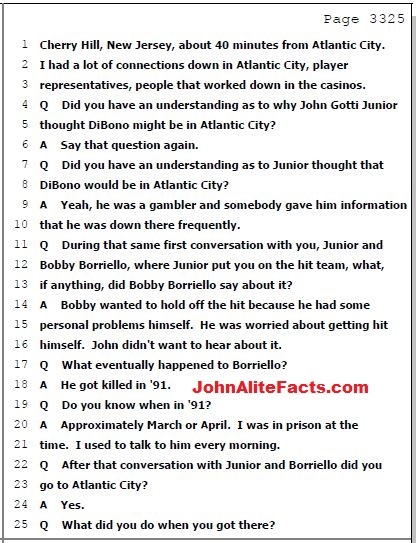 However: John Alite’s lies about Boriello were so brazen at the trials where he testified that he even said when he was in the Camden County Jail in 1991 he would call Boriello’s house daily. What John Alite keeps leaving out is one of the primary reasons why the jurors at the 2009 Gotti trial did not believe him when he said that he called Boriello’s house every day. While telling his story of how close he was to Boriello, and how involved they were together, Alite said that when he used to call Boriello’s house each morning from prison he would first speak to his wife, who would then pass the phone to him. Yet if Alite really did know Boriello and his wife the way he claimed? John Alite would have known that her name was Sue, and not Linda, when he lied about her during the Gotti trial. Why did John Alite get that wrong? If they were all such good friends, and John Alite spoke to Susan Boriello daily– or, multiple times a week, his testimony varied– if John Alite even found out about her husband’s murder from her then how come John Alite didn’t know her name? Radio: Frank Morano/Kasparoza on John Alite, Curtis Sliwa, "The Church Fire"
My uncle was gonna let bobby use his old bar as a social club down on court street , never once did I ever see this clown with bobby !!! Tommy he is a LIAR, he is a obsessed psychopath, as the 1-2 nuts who entertain him. Your stand up Jimmy, wish you the best.